We’ve been releasing some pretty dark episodes of late. There was the distorted Degenerates, the psychotic Mixmaster Satan, the electrocutional Artificial, and the pissed-off Angry Beavers. 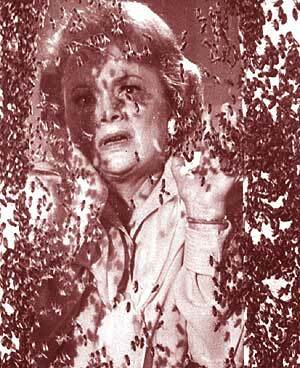 But this week’s episode The Swarm outdoes them all in its deeply disturbing drone. Plug all impressionable ears: this one is positively possessive! The Swarm stars Anderson Cook from Ortolan on guitar, voice, and no-input mixer; Dylan Simon from Mass at Dawn on Shruti Box, Echoplex, Sears & Roebuck Tremelo Unit, Ring Mod, Gong, and voice; DaveX on processing via phone line; and myself on delay. I also did the live mixing, editing, and post processing. I’m listening to this one now. Should be interesting to hear this again– as I recall, monitoring my end of things was rather difficult, so I’m hoping that my contributions aren’t too heavy-handed. Thanks for uploading this one. I really like everyone’s contributions.